The three time National Champion Jeff Orosz celebrates with runner up Warren Diem, and third place finisher Chad Rall after the AMA/USA Speedway Long Track National Championship in Canton, Ohio. 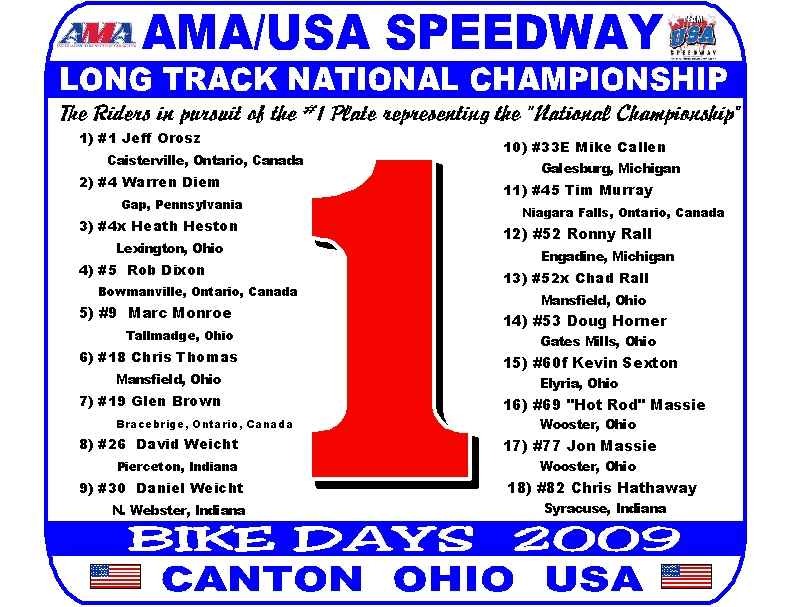 Jeff Orosz came out on top at the AMA/USA Speedway Long Track National Championship, Saturday May 23, 2009 at the Stark County Fairgrounds in Canton, Ohio for the third year in a row. The Long Track National was organized by Scotty Brown and the Bike Days Motorcycle Club www.bikedays.com and is sponsored by Freedom Harley Davidson, Miller Lite Racing, Applied Innovations, Barnett Clutch, Dixie International, K-K Motorcycle Supply, Moose Racing, NJK Leathers, Oury Grip, PJ’s Fabricating and Wiseco Piston. 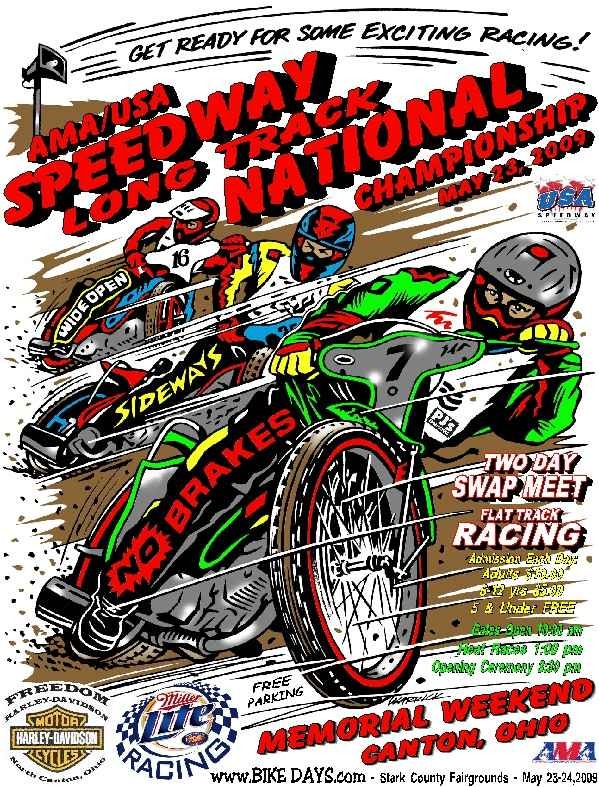 The championship ran in conjunction with the AMA Flat Track Motorcycle Races and Swap Meet at the BIKE DAYS 7th annual meet. It was a warm and sunny 83 degree Memorial Weekend, with perfect conditions on the half mile limestone cushion track. Eighteen of North Americas’ finest Long Track Riders assembled in Canton traveling from Indiana, Michigan, Ohio, Pennsylvania and Canada competed for the National Championship. Brian Fowler of the Brian and Joe morning radio show and Bob Sigler were the announcers on hand to call the action. This was not an easy victory for Orosz due to the motor trouble he experienced in the second round of heats which sent him to the Last Chance Qualifiers (LCQ). Pennsylvania rider Warren Diem and Chad Rall (son of Hall of Fame Rider Ronnie Rall) were tied with 28 points after the three rounds of heats. The heat race points were tabulated, transferring the top six riders into two Semi Finals, leaving six positions open for the top three finishers from each the Last Chance Qualifiers. The National Long Track format consisted of three rounds of point gathering Heats, two Last Chance Qualifiers, two Semi Finals and an “A, B and C” Main. Jeff Orosz won the first LCQ with Jon Massie winning the second LCQ. “AMA Hall of Fame rider” Ronny Rall also made the cut by finishing third in the second LCQ. In the first Semi Final, Jeff Orosz won followed by Chad Rall and Chris Thomas, transferring them directly to the A Main. In the second Semi Final, Warren Diem won with Rob Dixon second and Glenn Brown third, also transferring them directly to the A Main. The remaining six riders from the Semi Finals (4th through 6th), transferred to the B Main. In the A final – Jeff Orosz took the early advantage with a great start. Warren Diem trailed in second and Chad Rall third. Diem made a great charge midway but it was too late, Orosz was the first to cross the finish line and win the Championship for the third time. 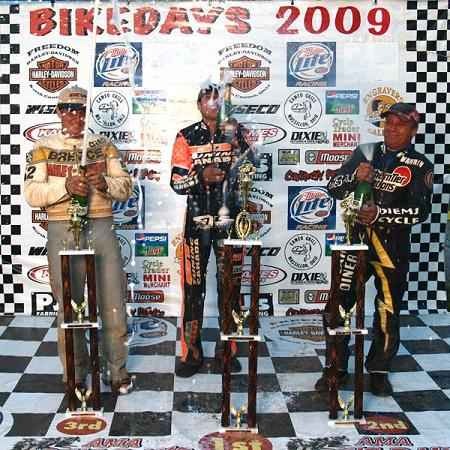 Mark your calendar for the California Speedway Long Track Championship held in Perris, California on July 11, 2009. The Ohio Speedway Long Track Championship will be held in Wauseon, Ohio on Friday, July 17, 2009 combined with a great night of Antique Motorcycle racing at the 27th annual AMCA National meet at the Fulton County Fairgrounds in Wauseon, Ohio. Visit www.bikedays.com for current information. Chad Rall #52 gets the hole shot with Warren Diem #4 in close pursuit as the eventual winner Jeff Orosz #1 motor goes away in the second round of heats at the AMA/USA Speedway Long Track National Championship during Bike Days in Canton, Ohio over Memorial weekend.